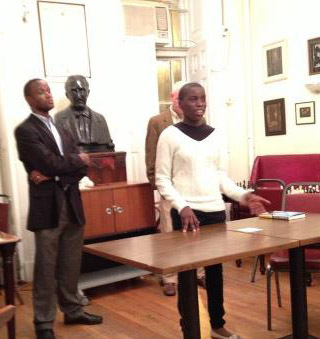 Phiona Mutesi speaking at New York’s Marshall Chess Club with coach Robert Katende. Photo by Latisha Ballard. Phiona Mutesi has had a whirlwind experience since participating in the 2010 Olympiad in Khanty-Mansiysk, Russia. This is not Prince Akeem’s fictitious “Coming to America,” but a true story of a Ugandan schoolgirl who has found a path out of poverty. Her story first broke on “ESPN: The Magazine” as her of story rising from the slums of Uganda hit the chess world. Thereafter, the story begin to gain traction when Tim Crothers traveled to Uganda to investigate this amazing story. In two years time, his book “The Queen of Katwe” hit the bookstores and has been a sensation. This is not a story about chess as much as it is a story about triumph over adversity. The idea that chess can lead one from such unfortunate circumstances onto a path of promise and hope. In the past few weeks, Phiona, her coach Robert Katende and author have toured the U.S. in order to publicize her story and provide inspiration for so many aspiring young players. One of the first major stops has been to Philadelphia where she met with WGM Jennifer Shahade for a discussion and a chess session. She then set out for the New York City’s famous Marshall Chess Club for a book signing and discussion on December 4th. Latisha Ballard told The Chess Drum that she was going to the signing with her son, National Master Justus Williams. There was quite a bit of excitement at the prospect of meeting her. Phiona will continue her tour throughout the U.S. and end up on the west coast in California (Gompers Preparatory Academy in San Diego and the California Youth Chess League in Santa Clarita) One thing is for sure… her life will never be the same. She is only 16 and has so much promise. Chess may not be the thing she will take as a profession, but she has more options as a result of it. The Chess Drum, “Mutesi graces cover of Chess Life,” 5 November 2012. The Chess Drum, “The Queen of Katwe,” 24 October 2012 (Book Review). Tim Crothers (ESPN), “The Game of Her Life,” 10 January 2011. The Chess Drum, “Mutesi’s trek to Siberia,” 5 January 2011. Phiona and her coach Robert will be out in California on tomorrow, December 10th before heading back to Uganda. Her visit is certainly helping spread the word: chess does indeed teach problem solving and planning skills and in Phiona’s case gives her hope for a very different future. I believe the term “prodigy” is being abused in reference to Phiona. The media is doing a disservice in billing her this way. I also read somewhere that she is listed as “African Champion” and another saying that she is winning tournaments all over the world. On the other hand you have chess people discounting her story because she has not reached a high skill level. I believe both sides are wrong. The story is powerful enough such that they do not have to embellish or diminish her skills. This story is more about triumph over adversity than it is about chess itself. I agree with your observation daaim!!!!! Yes… I heard some Africans compare her to Judit Polgar already. I believe we are getting too far ahead.